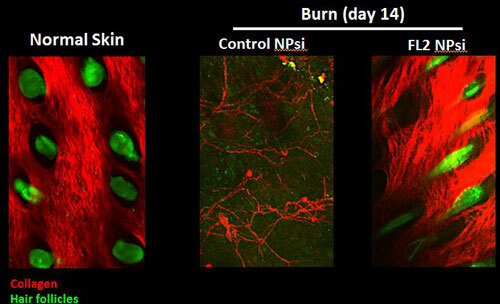 (Nanowerk News) An experimental therapy developed by researchers at Albert Einstein College of Medicine of Yeshiva University cut in half the time it takes to heal wounds compared to no treatment at all. Details of the therapy, which was successfully tested in mice, were published online in the Journal of Investigative Dermatology ("Fidgetin-like 2: a novel microtubule-based regulator of wound healing"). “We envision that our nanoparticle therapy could be used to speed the healing of all sorts of wounds, including everyday cuts and burns, surgical incisions, and chronic skin ulcers, which are a particular problem in the elderly and people with diabetes,” said study co-leader David J. Sharp, Ph.D., professor of physiology & biophysics at Einstein. Dr. Sharp and his colleagues had earlier discovered that an enzyme called fidgetin-like 2 (FL2) puts the brakes on skin cells as they migrate towards wounds to heal them. They reasoned that the healing cells could reach their destination faster if their levels of FL2 could be reduced. So they developed a drug that inactivates the gene that makes FL2 and then put the drug in tiny gel capsules called nanoparticles and applied the nanoparticles to wounds on mice. The treated wounds healed much faster than untreated wounds. FL2 belongs to the fidgetin family of enzymes, which play varying roles in cellular development and function. To learn more about FL2’s role in humans, Dr. Sharp suppressed FL2’s activity in human cells in tissue culture. When those cells were placed on a standard wound assay (for measuring properties like cell migration and proliferation), they moved unusually fast. “This suggested that if we could find a way to target FL2 in humans, we might have a new way to promote wound healing,” said Dr. Sharp. To find a way to deliver siRNAs for curbing FL2, Dr. Sharp collaborated with Joel Friedman, M.D., Ph.D., professor of physiology & biophysics and of medicine at Einstein, and study co-leader Adam Friedman, M.D., director of dermatologic research at Einstein and Montefiore, who together had developed nanoparticles that protect molecules such as siRNA from being degraded as they ferry the molecules to their intended targets. Dr. Sharp plans to start testing the therapy on pigs, whose skin closely resembles that of humans, within months.